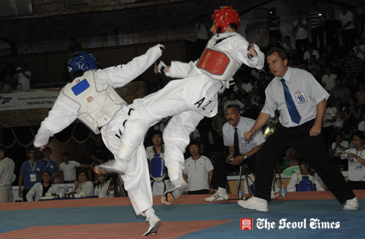 The 2009 WTF World Cup Taekwondo Team Championships ended in a great success after four days of heated competitions in Baku, Azerbaijan on June 14, 2009. Turkey and Russia showed their respective supremacy in taekwondo, while host Azerbaijan emerged as a strong taekwondo power. In the women's division, Korea won the gold medal, while Russia clinched the silver. The bronze went to Turkey and Morocco. Korea managed to win over France 3-2 in a quarterfinal match before advancing to the semifinals, in which it edged Turkey 3-2. In the men's division, Turkey brushed aside a stiff challenge of Iran to grab the gold medal. Iran had to settle for the silver, while Azerbaijan and Russia shared the bronze medal. The World Cup featured WTF-recognized electronic protectors, the first of its kind in the WTF-promoted event. It also introduced an instant video replay system under new WTF Competition Rules. All these and others drew great interest from both the public and the global media. No protests were recorded at the 2009 WTF World Cup Taekwondo Team Championships, with each team fielding five athletes. All the competitions were conduced in a very orderly, dynamic atmosphere. The World Cup drew 23 male and 23 female teams from a total of 28 countries. After three days of round-robin preliminary rounds, the top eight team in the men's and women's division advanced to the quarterfinal round. The Good Fighting Spirit Awards went to Canada, Great Britain and Egypt, while Uzbekistan, Brazil and China received Active Participation Prizes. The Best Referee Awards went to Mr. Song Chul Kim of Canada, Ms. Jatuporn Hemwonno of Thailand, Mr. Samuel Michael Loiacono of Australia, Mr. Serge Sembona of France, and Ms. Barbara Ruth Marian of Canada.